Oceanographers are a bit crazy. This is especially true after sailing and working 4 weeks aboard a ship in the ice and fog and snow and drizzle that characterize summer in Fram Strait between northern Greenland and Spitsbergen. The one color one does NOT see is green, there just is none. So, when we got off FS Polarstern last thursday, what did we do? Walk … lots. Thursday Nicole and I walked with all our luggage about 2 miles from the ship to our hotels in downtown Tromso. Each of us had a hand-held GPS for navigation to make sure we did not miss the Botanical Gardens. It was a marvelous rock garden to admire with an amazing blend of colors and plants both small and large. We are about 300 miles north of the Arctic Circle, so the plants that do well here are a hardy local bunch. A few even originate from as far as Tibet, some only recently discovered, but never described, so one of the gardeners tells me. Oceanographers ashore in Tromso’s Botanical Gardens. Azaleas and rhododendrons at almost 70 N latitude. Neither plant not animal growing on a birch tree in Tromso’s Botanical Gardens..
After we drop our cumbersome luggage in our hotels, Nicole and I set out for a geocaching expedition to explore the southern part of this island. There are 24 hours of day light, so no need to sleep while the sun is up. Friday was a blur as it drizzled and rained all day in Tromso as it usually does; or so I am told. So, I pretty much sleep all day, get in touch with family and friends, and study the weather forecast for the weekend. It is supposed to be sunny again and two young German Physical Oceanographers and I plan for a big trip up the mountains the next day. Starting at our hotels, we cross the bridge to the mainland at 9am and start climbing up towards 4055 feet (1236 meters) high Tromsdalstinen. We make it up and down without any major mishap, but it took us 11 hours. I let the pictures we took along the way do the talking. Rarely tastes a beer this good even at the $10 for 3/4 of a pint. Good sleep after that to rest a sore and aching body. Tromsdalstinen from the valley floor. Author next to a geocache in the valley. View to the south on the decent from Tromsdalstinen. Fellow oceanographers resting after our decent over the ridge in the background. Crossing streams. The snow bridge collapsed just after Benjamin R. crossed it. I was very nervous as I had to cross, too. Posted on borrowed time from a hotel in Copenhagen. This entry was posted in Norway, Polarstern and tagged Barents Sea, Botanical Gardens, fjords, hiking, Tromsdalstinen, tromso. Bookmark the permalink. Hello Andreas! I took wrong of you. You really is a healthy and strong man who takes Tromsdalstinden only walking. And you started from downtown. I saw your name on the paperlogs when I climbed Tromsdalstinden couple a days after you. I drove my car to the last parking area before I started to walk. And you probably have taken a lot more of the geocaches than me. So I’ve to say I’m sorry for my little joke I left on one of the logs (online) where you didn’t find the cache. I thought it was one of them who geocaches “from the car by just opening the drivers window”, when I saw you missed two or three caches that even I found. 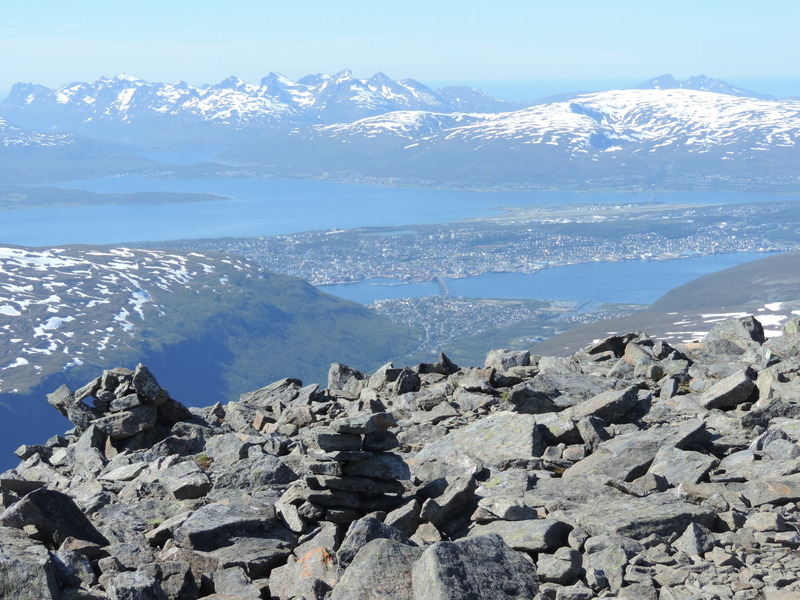 If you take the same “digital walk” and climb the Tromsdalstinden, you will see that I didn’t find a lot of geocaches that you all have logged.